KNOXVILLE/JEFFERSON COUNTY, Tenn. — At only 26 years of age, Jacob Wheeler has already won more than his share of big-money bass tournaments. But he’s never won one under the same set of circumstances he faced this week during the Bassmaster Elite at Cherokee Lake — and he’s quick to admit that he may never do it again. After a week of adversity that some anglers don’t face in an entire season, Wheeler won the event and its $100,000 first-place prize with a four-day total of 69 pounds, 13 ounces. A final-day catch of 18-3 — his biggest of the tournament — helped him jump from third place into the winner’s spot. Jamie Hartman finished second with 69-3, and Jesse Wiggins, who held a slim lead through the first three rounds of fishing, placed third with 69-0. “I’ve won a few tournaments in my day,” Wheeler said. “But this one is by far the craziest, coolest win I’ve ever had — there’s nothing even close to it. Wheeler had a fairly normal opening round, catching 17-10 to land in second place. But on the second day, things got crazy. During pre-practice, Wheeler said he graphed the entire lake and had 1,600 waypoints marked from one end of the fishery to the other on his depthfinder. But an electronics mix-up on Friday left him without half of those waypoints, and he had to do much of his fishing by memory. He still managed 16-15 to stay among the leaders. Then on Saturday, one of his batteries malfunctioned, leaving him without a working trolling motor. So he took advantage of a little-known B.A.S.S. rule that allows a stranded angler to fish with another competitor as long as a marshal is present. While fishing with Elite Series rookie Dustin Connell, Wheeler caught two of his biggest fish of the day and brought 17-1 to the scales to land in second place heading into Championship Sunday. On the final day, having a wide selection of areas to choose from made all the difference. He came into the day trailing Wiggins and Hartman — two anglers who had done most of their damage on just one spot all week. Their fish became more finicky as the week went on, and Wheeler was able to run-and-gun his way past them. “I had a backup card with all of my waypoints, so I had them back for days 3 and 4,” Wheeler said. “I could run to every rock, every boulder, every piece of structure I had found in practice. Wheeler relied all week on a VMC Moon Eye Jighead with a 3-inch soft jerkbait in simple pearl white. He was watching for smallmouth on his Lowrance depthfinder and literally dropping the bait to specific fish in 20 to 30 feet of water. He caught the biggest part of his limit during one 10-minute stretch around 10:30 a.m. Sunday. “It was absolutely crazy,” Wheeler said. “I was fishing a little pond, and I came across a wad of fish. There were so many of them that I thought they might be stripers. But I know the difference between stripers and smallmouth on my graph, and I thought those looked like big, old smallmouth. Despite the amazing flurry, Wheeler still felt like he needed one more good fish as the day was winding down. He got it just in nick of time. Since Wheeler has won so much money on other major trails, he’s labeled a newcomer this year instead of a rookie on the Elite Series. But this was technically his second Elite Series win. He qualified for the 2014 BASSfest event on Chickamauga Lake because of his solid finishes in the Bass Pro Shops Bassmaster Opens. He won that tournament and an automatic berth into the 2015 GEICO Bassmaster Classic. Though he’s batting 1,000 in Elite events, he knows the level of competition he’ll be facing the rest of the season. Fishing was predicted to be outstanding on Cherokee Lake, a fishery the Elite Series had never visited before, and it didn’t disappoint. True, it didn’t produce any giant bass — a 5-5 bass caught by Randall Tharp was big enough to win the $1,500 Phoenix Boats Big Bass award — but the 110 anglers weighed in 1,159 keeper bass during the event, and those bass averaged nearly 3 pounds apiece. Wheeler was awarded $1,000 for the leading the Toyota Bassmaster Angler of the Year points race at the end of the event. 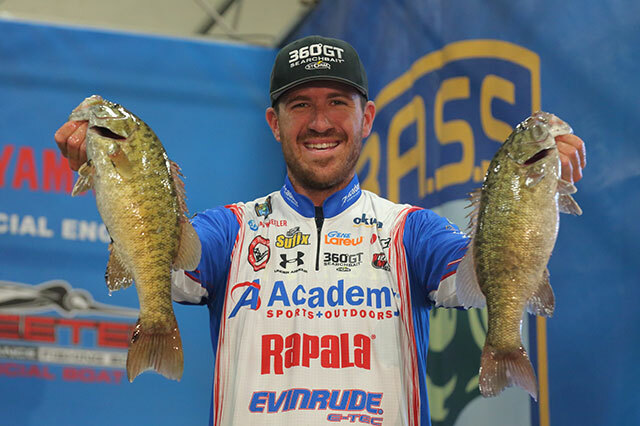 Hartman earned the Power-Pole Captain’s Cash Award of $1,000 for being the highest-placing angler who is registered and eligible and uses a client-approved product on his boat. Wiggins earned $500 as the recipient of the Livingston Lures Day 2 Leader Award. The event was hosted by the Economic Development Alliance of Jefferson County and Visit Knoxville.